Large images published on websites can lead to slow loading speed, thus compressing them is always recommended. S-Ultra PNG Compressor is a useful piece of software that allows you to significantly reduce the file size of PNG images, while retaining their original quality. The tool provides three compression mode, with the first one being default. The other two modes do not reduce the files size as much as the first one. 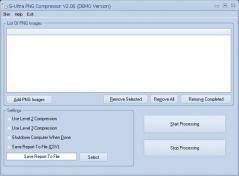 S-Ultra PNG Compressor can compress multiple files at the same time, plus it can be set to shut down the computer when the task is finished.